"Communicate with your game companions by voice with the freeware software, Raidcall." RaidCall is a completely free application which was designed for letting the players of online games communicate with each other while gaming, or just during their free time. The software has many other well known competitors that release software that isn't usually free. Raidcall is usually considered the free alternative to these applications and can be used for just able any game. With a simple process, you can also have a free server hosted for Raidcall at no cost to you. You are given a link to your Raidcall that you share with your friends, clan, or guild - whatever you plan to use it for. 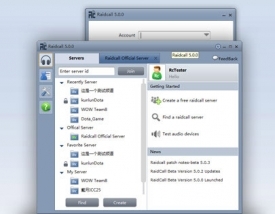 While Raidcall can be used for just about anything, but it is generally used for games such as World of Warcraft and StarCraft. It is incredibly popular for use for World of Warcraft guilds and the like. For starting to use RaidCall we have to create a user on its web page and join some chat room (we can do that using a finder or directly introducing the ID of the room we want to join). Either that, or you can make your own chat room in which you can use for what ever reason you want. Got a guild, clan, group of friends that you would like to communicate with for free and with simple access? Raidcall is probably a good alternative to the paid applications for your needs. Once we have joined a chat room or you have created your own, the only thing you have to do to communicate is to press the control key and talk through your microphone. You also have many options in the preferences for microphone and sound configurations while using Raidcall, just as you would expect from any voice communication application of its class. Moreover, RaidCall offers more advanced options like the use of the passwords, black user lists, room admins and so on. The only inconvenience is that the maximum number of users by room is 30, even though it is quite enough in most situations. Though, as a free application this is by far one of the best options out there if you do not feel like paying for the alternatives out there.